After ten days of concerted packing of boxes, suitcases, the Pod, we were ready to depart full Spring in Little Rock and journey back in time to the early Spring of Bennington, Vermont. But first, we had to take care of some business. Our realtor arrived early on departure day, bagels and offer in hand. We signed the acceptance for the sale of one of our river-view lots, gathered up the dogs and their paraphernalia, put in that last pair of shoes, and took to the Interstate System. Do we thank Eisenhower for this opportunity, or curse him? I-40 to Memphis was not the lowest level of hell. The road construction only slowed us to about 50 mph. At about Jackson, TN, it started raining. And it didn't really stop for two days. Our first night in Cookeville, TN, contained only a little sleep between crashing thunder and torrential rain. The drive through the last several thousand miles of Tennessee (or maybe it was only 200) was foggy, wet, knuckle-whitening. We cheered when we finally hit the Virginia line, but most of the normally lovely drive between the ranges of the Appalachians and the Blue Ridge, up the truck-heavy I-81, matched the horror of Tennessee. Finally, weary and rattled from tense driving, we skipped across a few miles of West Virgina and lighted in Hagerstown, MD, where it rained. But Pat's niece, Tiana, was waiting for us at our hotel bearing gifts of coffee, tea, cookies, wine, etc. Dinner with her was a much-needed interlude. Down to the home-stretch, we stayed on I-81 through Harrisburg, PA, then drove on I-78 east on the pot-hole pocked Pennsylvania stretch until we reached the relative Nirvana of smooth New Jersey roadway. There we swung North on I-787 until the New York Throughway (I-87) carried us to Albany, NY. A right turn onto NY 7, led us to the Vermont line and VT 9. One more sprint, and we crossed Monument Ave just above our house. Whew! We made it! During the trip we noticed that we moved in and out of Spring. Here in Bennington, the trees are just beginning to unfurl their leaves and the perennials are just pushing up their heads. We got here just in time! 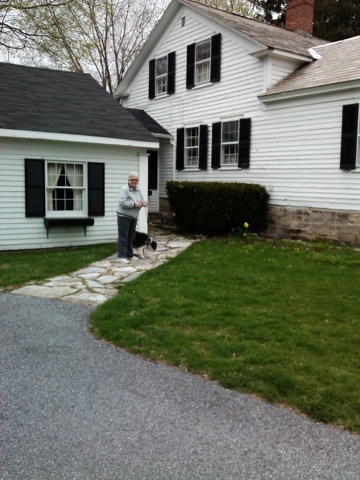 Pat and Lacy arrive at our house.